Advanced undergraduates in mechanical engineering, materials science and applied physics. Specialising postgraduates, and applied physicists and design engineers within industry. 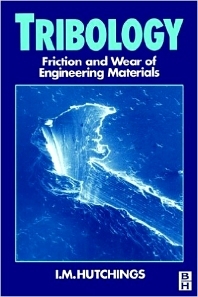 Preface Introduction Surface topography and surfaces in contact Friction Lubricants and lubrication Sliding wear Wear by hard particles Wear and design Surface engineering in tribology Materials for bearings Author index * Subject index. Professor Ian Hutchings has been GKN Professor of Manufacturing Engineering at the University of Cambridge since 2001. Before that, he was Reader in Tribology in the Department of Materials Science and Metallurgy. He has extensive experience in research and teaching on tribological topics. From 1998 to 2012, he was Editor-in-Chief of the international journal, Wear. He is the sole author of the first edition of 'Tribology: Friction and Wear of Engineering Materials' published in 1992, as well as numerous journal and conference papers. In 1994, he was awarded the Tribology Trust Silver Medal, in 2000 the Donald Julius Groen Prize by the Institution of Mechanical Engineers and in 2007 the Staudinger-Durrer Prize by ETH Zürich.